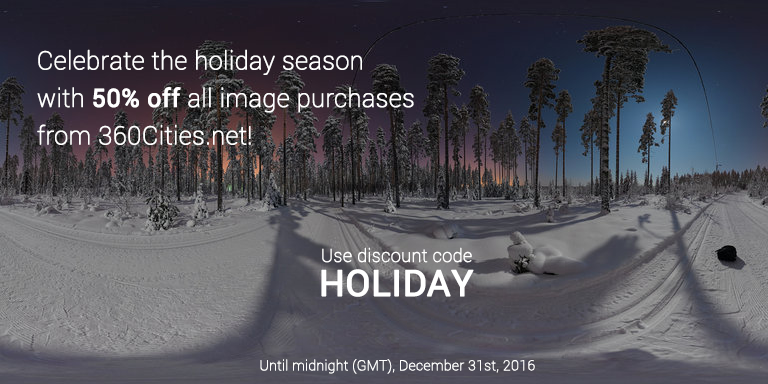 We’re happy to tell you as our licensing customer that as of today, all purchases of panoramic photo licenses are 50% off through midnight (GMT), December 31st, 2016. Just use discount code HOLIDAY when checking out. Come and enjoy our immersive 360-degree world at 360cities.net: search our massive database, roam over our world map, or enjoy the eye candy in our editors picks gallery. Research help is free, so if you’d like us to assist in finding what you need, contact us at info@360cities.net. The sale continues through midnight (GMT), December 31st, so be sure and take advantage!